On 24 June 1927, Annie Reynolds McKenzie (1902-1987) delivered her second child, a baby girl. She and her husband, Frank Ledbetter McKenzie (1902-1970), named her Betty Lou. The birth took place at home in Roberdel, North Carolina. When I was a young girl, we used to pass by that house every time we visited relatives and Momma would point it out. I’m not sure if it’s even still there, but I remember that it was very small. 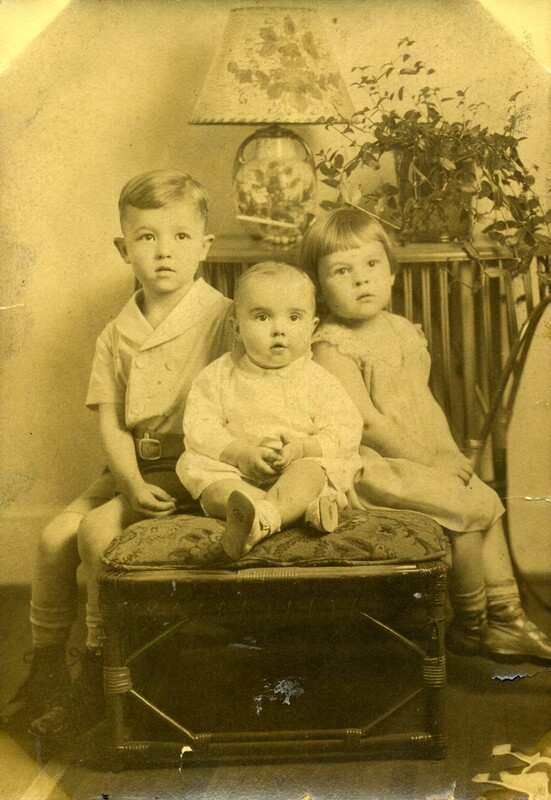 Malcolm, Benton, and Betty McKenzie around 1930. There was a catalpa tree in one of the yards, which, of course, had worms in it. Malcolm, Benton, and her cousin, Jim, would grab her, two of them holding her under the catalpa tree while the other one shook it. The worms rained down on her. 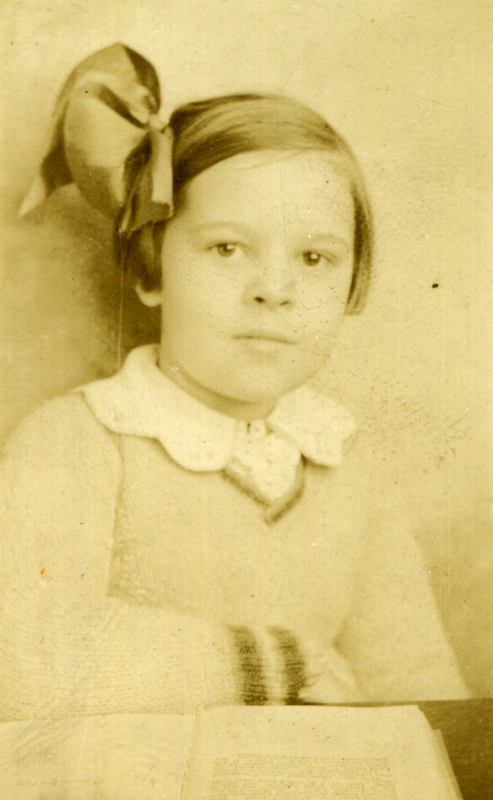 Momma as a young school girl, probably around 1935. She was always afraid of worms after that! But, bless her heart, when I’d play with the little inch worms in the dirt under our dogwood tree in Charlotte, she never let on how horrified she was! 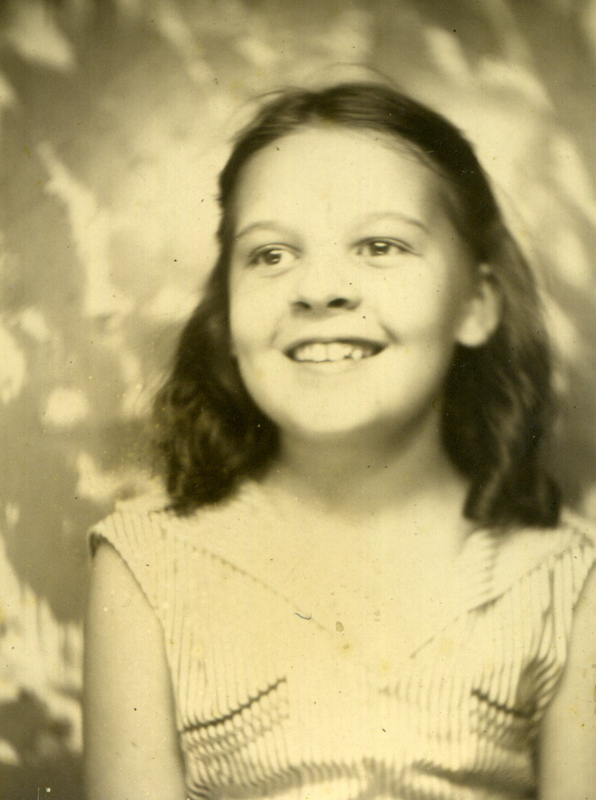 One of Momma’s elementary school pictures, probably around 1938. The family grew vegetables in their yard, including corn. Momma’s paternal grandmother, Lula O’Brien McKenzie (1870-1948), lived with them and tended the garden. Momma told us she and Mary Neal (Baxley), her cousin, would go down the rows of corn and braid the silks, much to her grandmother’s chagrin! Because her grandmother lived with them, Momma’s mother was able to work outside the home. 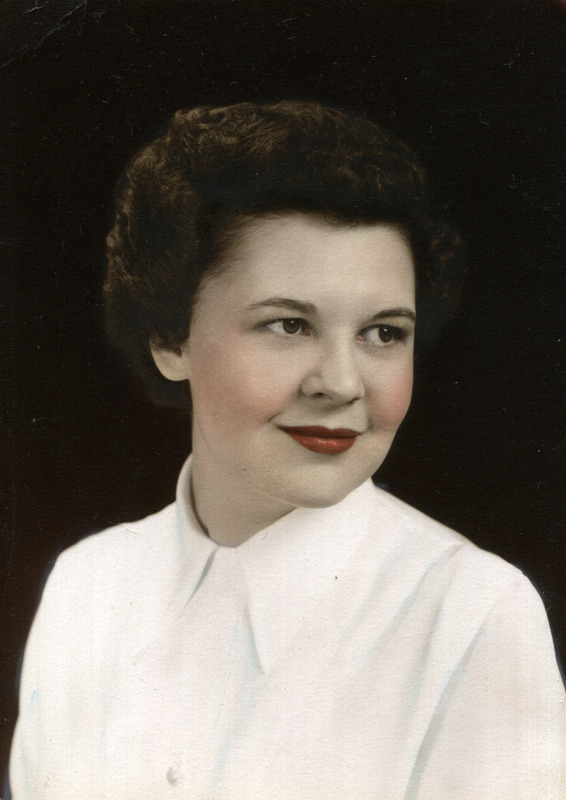 She was a buyer for R. W. Goodman Co., and later a bookkeeper in the downtown store. This brought in extra income for the family. 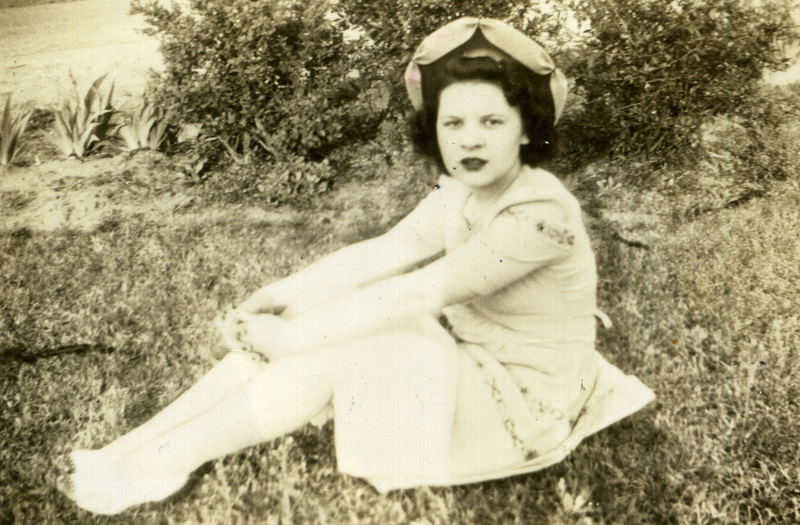 Momma in high school, probably around 1943. Momma went to Rockingham High School, graduating in 1945. Her junior year, she was the winner of the Citizenship Cup, an award originated by her father’s high school class in 1921. She was known for her beautiful soprano voice and voted Most Musical by her senior class. She was also voted Best Actress, Best All’Round, and Most Outstanding Personality. She edited the school news magazine “The Broadcaster,” and wrote and acted in one of the senior plays. Her favorite subjects were English, Home Economics, and, of course, Choir. She couldn’t stand math and got a friend to help her with geometry. The dorm was old with bad electrical connections, so there were rules about using appliances. You could have a hot plate and use it to boil water to clean your socks, but you couldn’t cook anything—and only one appliance on a floor could be plugged in at a time or a fuse would blow. If you were going to plug in your hot plate, you had to announce it so no one else would plug in theirs and blow a fuse. The house mother held the fuses and wasn’t amused when she had to replace them. The girls down the hall from Momma’s room defied the rules by cooking hotdogs underneath their socks! (Oh the ingenuity of college students!) Anyway, Momma and her roommate, Frances, decided to teach the electricity hogs a lesson. One evening they made a big show of announcing they were going to the music building to practice, turned off their room light, closed the door—but never left the room. Momma hid in the closet, and when the electricity hogs announced the use of their hot plate, Frances quickly plugged in and then unplugged their hot plate, threw it under the bed, and went to hide in the closet with Momma. Of course, this blew the fuse, the house mother had to replace it; they did this several times that evening. After some time passed, Momma and Frances again made a big deal of “returning” from the music building, asking the other girls what all the commotion was about in the dorm. 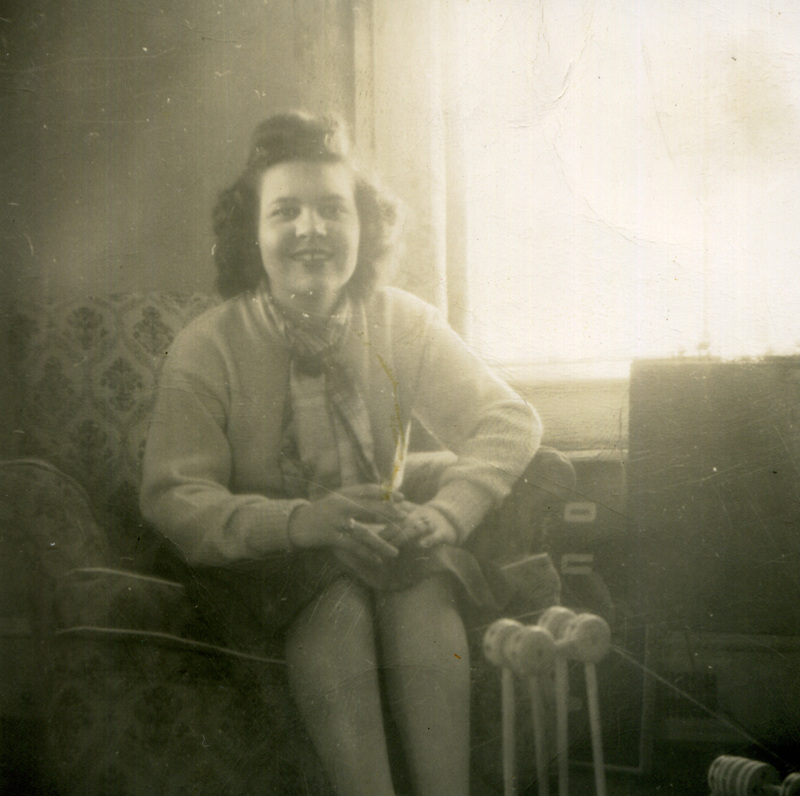 Momma in college, probably around 1948. For the rest of her college education, Momma went to Woman’s College (now the University of North Carolina at Greensboro). She lost almost all her credits when she transferred. Her last year there she realized it was going to take more than one year to finish her music degree and the tuition money wouldn’t last, so she took a secretarial course. She remained close friends with her college roommate and suite mates, meeting for a couple of reunions. Momma’s engagement picture, probably late 1949 or early 1950. Momma began her working career in Charlotte where she was employed by Duke Power Co. She lived with her maternal uncle’s family. After her marriage, she and Daddy moved to Lumberton and she worked in the offices of the Lumberton schools superintendent’s office. A return to Charlotte brought her to Queens College, where she worked until she started her family. When the family moved to Rockingham in the 1960s, Momma worked as a bookkeeper for a clothing store and a church. In addition to working in an office, she put her musical talent to work as choir director at Purcell Methodist Church in Charlotte, and substitute choral teacher at L.J. Bell Elementary and Rockingham High School in Rockingham. 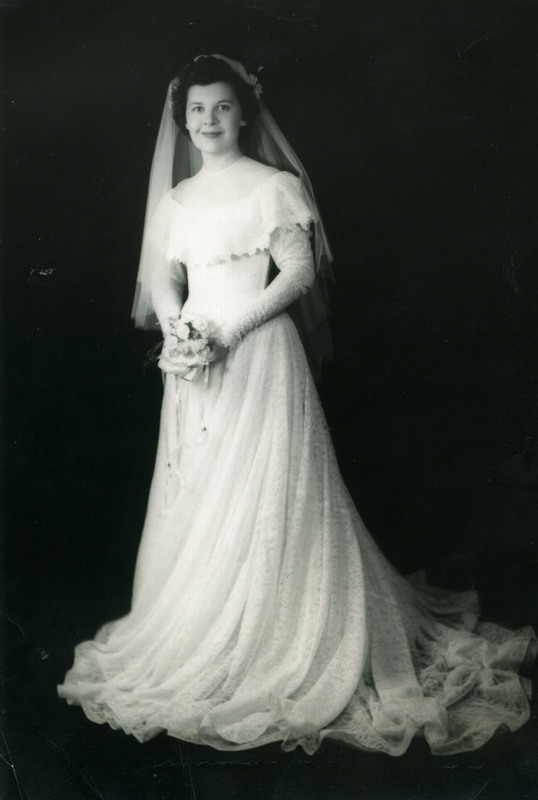 Momma in her wedding dress. She borrowed it from her cousin, Mary Neal Baxley. Momma and Daddy knew each other in high school. Momma married Jack Rohleder (1927-1996) in Rockingham at First Methodist Church. It was a fairly large wedding. She had four bridesmaids (her college roommate, her two cousins, and one of Daddy’s cousins) and there were six groomsmen (Momma’s brothers, Daddy’s older brother, and three of his friends). After a honeymoon at Fontana Dam in the mountains of North Carolina, they settled in Lumberton, North Carolina. They weren’t there long before Daddy got transferred to Charlotte. They settled into an apartment near Purcell Methodist Church, which they joined, and later moved into a new house just before I was born. My brother, Carl, and sister, Ruth, followed. Momma’s only job away from home during those early years was directing the choir at church. During the day she would entertain us, fix our meals, and sew our clothes. She was a really good seamstress and made almost all of our clothes. Even my brother had a few handmade coats and pants when he was little. A few items stand out for me: a powder-blue wool coat with bound buttonholes, a white wool cape, an ice-blue brocade party dress, a yellow lace-covered prom dress, and a faux-fur leopard coat with matching beret. Besides our clothes, she made curtains for the house and clothes for out dolls. We used to go to the beach each summer with the Caldwell family, until the two mothers decided they weren’t getting a vacation (still cooked, cleaned, wiped up after kids). Getting caught in a hurricane didn’t help, either. One summer after this declaration, Momma decided the living room needed a re-do. Daddy took the kids to the beach and Momma stayed home to paint the living room, make new curtains, and probably new slip covers for the furniture. It was a whole new look when we returned. The family moved to Rockingham when I was ten years old. Daddy was thrilled, Momma not so much. The house we lived in faced east with no trees behind it. The afternoon sun poured into the kitchen, making it a little sauna. We didn’t have air conditioning, either. Momma finally put her foot down—if Daddy wanted a hot meal before the next cold spell, he needed to get an air conditioner. It wasn’t long before he installed a window unit to blow cold air into the kitchen. Although Momma was a good cook, there were some things she fixed that, I thought, were of questionable taste. Mainly, tuna and macaroni casserole. This involved a box of elbow macaroni, a can of tuna, and some canned peas, all mixed with mayonnaise. We dutifully ate it. Years later, after all the kids were out of the house, she discovered that Daddy didn’t like this dish and had only been eating it to be nice since she went to all that trouble to fix it. Come to find out, Momma didn’t like it either. She only fixed it because she thought Daddy liked it. Ugh, all those years of yucky casserole could have been avoided if my parents hadn’t been so nice to each other! We moved into the house on Scotland Avenue a couple of years after arriving in Rockingham. Daddy bought it at auction on the courthouse steps. That was the Rohleder home for the next ten years. The kids got through high school and off to college. There were family gatherings, kids’ parties, work functions, and bridge games. Room functions changed. The dining room was a den before it was a dining room, which only came into being because Momma and her friend Bookie Wallace changed dining tables. Bedrooms changed around, too. Ruth and I shared a room for a bit, then I finally got my own room when Momma decided not to have a den anymore (the den in the dining room moved to one of the bedrooms before becoming defunct). Then later I switched bedrooms with my parents. 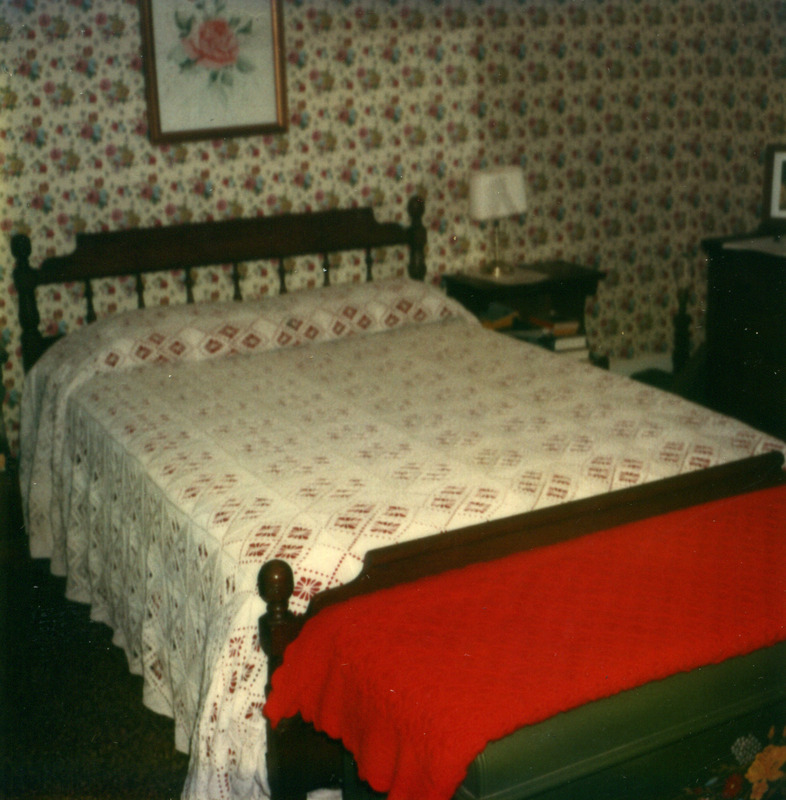 Momma crocheted this bedspread over the course of about a year, finishing it in November 1978. She had red and green sheets she used under it to show off the design. After I graduated from college, we moved back to Charlotte. Momma and Daddy found an older home on Sharon Road. Momma was thrilled to be back in Charlotte and loved her new house. Working with the red carpet in the living room and the green shag carpet in the bedroom, she painted, wall-papered, sewed, and otherwise whipped the house into shape. Gone were the Christmas green walls and red fiberglass curtains of the dining room. Gone were the black velvet drapes in the living room. She made neutral curtains for the windows, edged with what seemed like miles of lace that I crocheted. The dining room and master bedroom got wall paper; my room got a new coat of baby blue paint and Priscilla curtains. Even the kitchen got a wall of wallpaper. The house was greatly improved and Momma was happy. Momma enjoyed crocheting. She was prolific in her output, creating afghans, bedspreads, placemats, even purses, for friends and relatives. In later years, Momma made lap blankets for shut-ins, donated through the Kiwanis Club. When I was a young girl, she did a bit of embroidery and tried her hand at knitting, but in the end crocheting won out. Watercolor Momma painted in 1971. 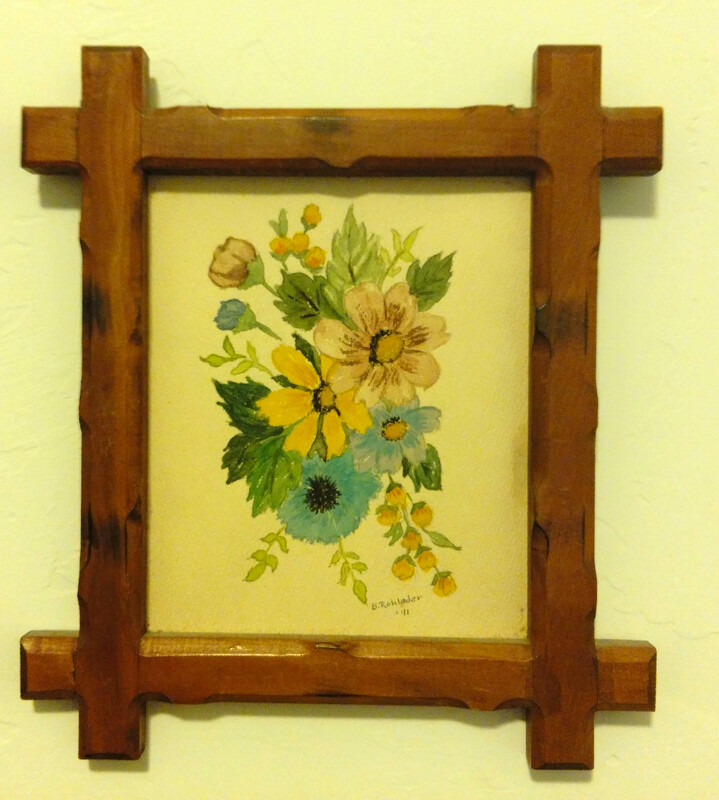 It’s hanging in my guest room. She could draw really well. I had paper dolls when I was young, but they always seemed so large and had weird poses. Momma drew a doll on a white piece of cardboard, and she was tiny; just a few inches tall. That was the perfect size to trace round the clothes in the Sears and Penneys catalogs. When the doll wore out, Momma would just draw another one the same size. Momma really liked games. Her cousin Jeanne taught her to play tennis, and it wasn’t long before Momma was serving aces and winning all the sets. This bit of athleticism didn’t last long, though. She did enjoy watching the Atlanta Braves on TV. One of her favorite childhood games was jack rocks. She had long fingers and could catch two sets of jacks on the back of her hand. She was still sitting in the middle of the kitchen floor playing jacks when she was in her 70s! I Spy was a favorite for rainy days. One day it was Momma’s turn to spy, so she said, “I spy something blue.” Well, we couldn’t find a blue thing anywhere! We even guessed the sky outside. She eventually had to tell us: it was playing on the stereo, Gershwin’s Rhapsody in Blue. She also liked card games. She’d play Old Maid and Rummy with us, Solitaire sitting at the dining room table, and bridge with her friends. Her favorite was probably bridge. 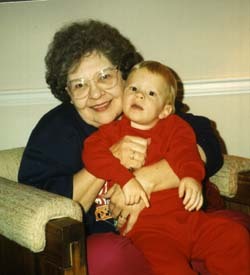 Around the time Ruth was born, five couples from Purcell Methodist Church in Charlotte decided to form a Bridge Club. They would meet once a month for dinner and bridge, moving from house to house. The host would provide beverages and the meat, while the other couples would bring salad, vegetables, bread, and dessert. When we moved to Rockingham the Bridge Club continued without Momma and Daddy, and when we moved back to Charlotte, they just picked up where they left off. By the time all the kids were grown and out of the house, this group was taking trips to the beach (in the fall, usually) and the mountains. If there weren’t enough people for two tables or bridge, they still got together for food and fun. Momma with her grandson, Zach. Daddy had retired early to help Momma take care of her mother, who had suffered a stroke. When my grandmother died, they started their retirement in earnest. They did a bit of traveling. Mostly they visited their grandchildren (my brother’s two daughters and my sister’s son). But they also took a trip to Buffalo to visit Daddy’s younger brother, and made a trip to New Jersey with the Caldwells (bridge club friends) to visit the Caldwell’s daughter and her family. Their dear friends in the bridge club were also retiring and everyone celebrated each retirement. They also started dying, which was sad for everyone. Daddy was the second of them to die. Momma stayed in the house on Sharon Road for a couple of years after Daddy died. They had been talking about moving somewhere that didn’t require yard maintenance, so Momma built on this and moved into a retirement community nearby. She loved it there and made many new friends. The expense, however, got to be too much for Momma’s budget and she moved to a similar place in Marietta, Georgia, close to my sister and brother. After an initial settling period, she began to make new friends. During her time in Georgia, her brother Malcolm died, and she traveled back to Charlotte for his funeral. Her health started to fail around this time and she moved into assisted living. When her younger brother, Benton, died, Momma was unable to attend his funeral. When her time came, a little over a year later, Momma was ready. She died on 13 June 2015, just shy of her 88th birthday. 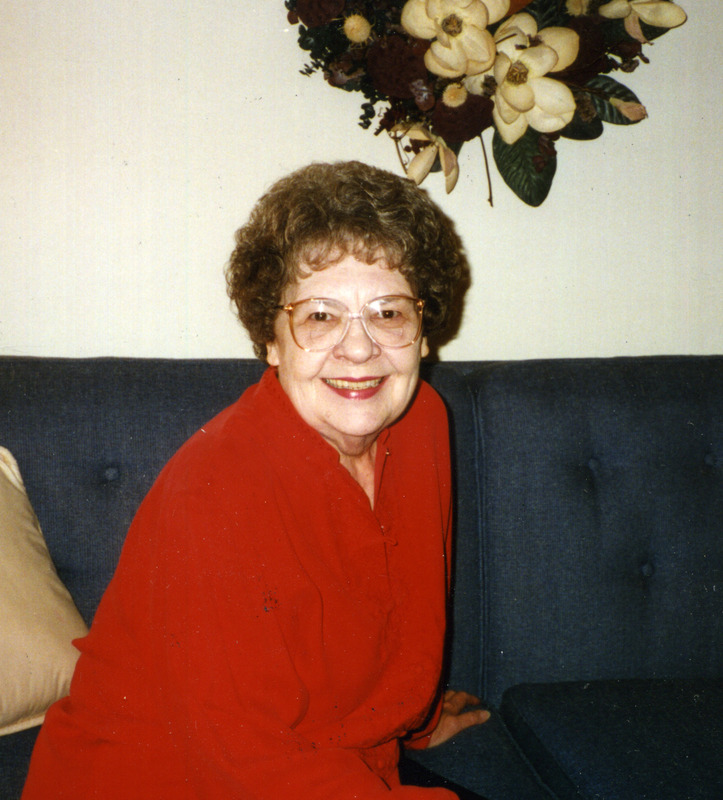 Since Momma wanted to be cremated, postponing her funeral was a simple matter. Several family members who wanted to come couldn’t make it in June. The memorial service was held on 10 October 2015 in Rockingham. The burial came first, and the family gathered in the pouring rain for a brief graveside rite. The service was at First United Methodist Church. There were hymns and readings, and one of the McKenzie cousins sang Simple Gifts, one of Momma’s favorites. Several people told their favorite story and I gave a eulogy. Everyone gathered in the fellowship hall afterwards for a meal. It was good to see all the relatives from both sides of the family, and long-time bridge club friends. Momma rarely met a stranger and she is missed by all who knew and loved her. This entry was posted in 52Ancestors, McKenzie, Reynolds, Rohleder. Bookmark the permalink. I had to laugh about the casserole. My mom was a horrible cook, but one thing she made that I liked was tuna casserole!! Oh my! Ours was served cold, like a salad. My main problem was those soft, mushy, yucky canned peas! Ewwww. Hate canned vegetables. Ours was a hot dish.